FIGO Pasta, the Atlanta-based pasta chain, has closed their location on East College Avenue in Decatur. Local sources indicate the restaurant quietly closed earlier this week with no advance notice to patrons. A sign on the restaurant's door confirms that the restaurant is permanently closed and directs patrons to the company's location off Moreland Avenue in the Edgewood Retail District. An employee reached by phone at the Edgewood location seemed unaware of the closure. This past fall, FIGO closed their restaurant at Perimeter Town Center near the intersection of Hammond Drive and Peachtree Dunwoody Road in Sandy Springs. Curries Indian Bistro later opened in its place. 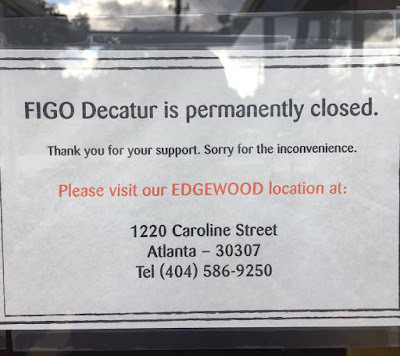 Following the Decatur and Sandy Springs closures, FIGO is down to just four locations: West Midtown, Buckhead, Edgewood and Vinings. FIGO previously closed locations in Alpharetta on North Point Parkway near North Point Mall and on Virginia Avenue in Virginia Highland. A location planned on Broad Street in downtown Atlanta was announced and started, but never opened. A number of respected Atlanta area restaurant industry veterans suggest that the next few months may bring even more restaurant closures as supply outpaces demand. Simply put, there are just not enough butts to fill all the new seats in all the new and existing restaurants. Are you surprised that FIGO closed its Decatur location? What would you like to see open in place of FIGO in Decatur? Do you think Atlanta is oversupplied with restaurants? There's a Figo in the Flatiron Building downtown but it's more of a grab/go, premade service so the quality is compromised. JT is spot - especially with the Perimeter location. We stopped going there as it got worse and worse. Painfully slow, shrinking portions and just not good any longer.